I had never seen Joel and Ethan Coen’s 2004 feature, THE LADYKILLERS, until only recently. However, funnily enough, I do remember its release. I remember seeing posters for the film displayed at Pioneer Place mall in downtown Portland, OR, which had a theatre that I frequented in those days. I distinctly recall being wholly uninterested in the film, an impression that barred me from seeing it until a few days ago– nearly ten years later. I was expecting a creatively indifferent dud like their previous film, 2003’s INTOLERABLE CRUELTY. However, I was pleasantly surprised by the film’s humble charms and it’s picturesque Mississippi setting. It’s certainly not one of the Coens’ great films, but it is an unexpectedly entertaining effort that plays like a hayseed version of OCEAN’S 11. Marva Munson (Irma P. Hall) is a wealthy widow and God-fearing Christian living in a small Mississippi town. One day, an eccentrically-dressed man named Professor Dorr (Tom Hanks) arrives at her doorstep, inquiring about her upstairs room for rent. He presents himself as a worldly, educated man and a member of a musical ensemble specializing in church music. He gains permission to live with Munson and have rehearsal with his band in her basement cellar, so as not to distract her during the evening. What he doesn’t tell her, however, is that his band is a front– together, his merry little group uses the basement to conspire and execute a daring heist of a ferryboat casino on the Mississippi River. The casino’s vault is located underground on the river bank, and Dorr’s master plan requires them to tunnel directly from underneath Munson’s house and into the vault. Dorr and his men pull off the heist successfully, but their getaway is bungled when Munson discovers their haul and presents them with a choice: give the money back and go with her to church, or go to prison. In response, these bumbling thieves come up with their own response: kill kindly old Mrs. Munson. The performances are energetic and suitable for the zany tone that the Coens are after. Tom Hanks clearly relishes the opportunity to ham it up, Coen-style. His Professor Dorr is a southern gentleman and a dandy with a bizarre, gulping nervous laugh. As the matronly Marva Munson, Irma P. Hall is endearing and sweet in her stubborn indignation. Her rants about the “hippity-hop” music are funny, and her conversations with the portrait of her long-dead husband are poignant. Despite her elderly stature, she’s a tough old broad that can stand her own against the basement full of criminals under her feet. Dorr’s crew, haphazardly assembled from want ads he placed in the paper, is a veritable rogue’s gallery of clumsy fools. The standouts (Marlon Wayans, JK Simmons, and Tzi Ma) provide the film with its best comedic moments. Wayans, as the gangsta janitor of the boat casino, is the fiery, unpredictable inside man. It’s a little sad, after his bravua performance four years earlier in Darren Aronofsky’s REQUIEM FOR A DREAM, to see him revert to a cliched ‘hood archetype, but his knack for comedic timing transcends the role’s limitations. As an animal wrangler/demolitions expert with chronic IBS, Simmons’ Garth Pancake makes full use of his particular cadence and body language. Simmons is known primarily as a comedic character actor, but here he gets to embrace a unique dynamic entirely apart from his best-known roles. And then there’s Tzi Ma, the mute Vietnamese shop owner known only as The General. He proved to by my favorite character in the film– his effortless slinking, tunneling, and cigarette-swallowing abilities are truly hilarious. The fact that he gets the film’s biggest laughs without barely speaking is a testament to Ma’s physical talents. THE LADYKILLERS is fairly light on the expected Coen cameos, but Bruce Campbell shows up briefly in a dog food commercial shoot. Stephen Root, who previously appeared up as the blind record label owner in O BROTHER, WHERE ART THOU? (2000), makes his second Coen outing as the casino’s stern manager and Wayan’s boss. It’s a small role, but Root makes the best of his limited screentime. Roger Deakins returns as Director of Photography, crafting a gorgeous looking film from the Coens’ preferred 35mm, 1.85:1 shooting format. The film takes on a sepia-tinted hue, drawing from a murky palette of earth tones and bright colors. The camerawork is appropriately elaborate in proportion to the film’s comfortable budget, consisting of artful dolly and crane movements that add scale to the story. The Coens also utilize a brilliant POV camera shot from within a football player’s helmet during a chaotic game. Moments like this make it clear that THE LADYKILLERS is considerably more engaging subject matter to the Coens than INTOLERABLE CRUELTY, their uninspired previous film. Subsequently, Deakin’s work is markedly better as well. Dennis Gassner reprises his Production Design duties as well, bringing an authentic, lived-in quality back to the Coen universe. He really brings out the Old World charm of the Deep South, making for an immersive experience. The languid pacing, courtesy of the Coens’ cutting alter-ego Roderick Jaynes, echoes the leisurely Southern mentality while bringing dynamic energy when it’s needed. Carter Burwell is again credited as crafting the score, but I barely noticed his efforts within the finished film. 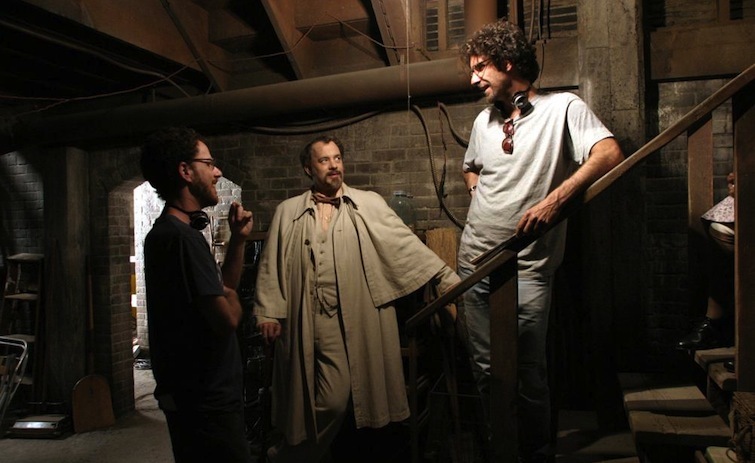 Instead, the story is peppered with a mix of blues, gospel, classical and hip-hop music– all chosen by the Coens’ frequent music supervisor T-Bone Burnett. The carefully chosen tracks do a great job in conveying a distinct culture and place, while giving the film a unique gospel-inspired patina. While it’s not as memorable a mix as the soundtrack to O BROTHER, WHERE ART THOU?, the soundtrack is another great survey of Americana folk music. The film is technically a remake of the 1955 of the same name, but the Coens bring enough of their quirky vision to the proceedings so that it stands on its own merits. It’s chock full of their signature gallows humor (sometimes quite literally), and the characters are well-drawn variations on unexpected archetypes. While it can still be considered one of their minor works, THE LADYKILLERS is far from their worst. Rather, it’s an underrated, enjoyable little surprise of a film– one that I suspect will respectably hold its own against the ravages of time. THE LADYKILLERS is currently available on standard definition DVD from Touchstone.